After I have explained that my dog Flynn and I are hiking the AT to someone new, they inevitably ask: are you bringing a weapon? When I respond with a lighthearted “no” along with a shoulder shrug, in desperation they ask: well, what about the creeps? What happens if you come across a bear? How are you going to protect yourself? Do you hitchhike? You best not be hitchhiking without a knife or something! Have you looked into concealed weapon permits? Its way too risky for young women to do that alone! Creeps, and ticks, and bears, oh my! OK, I might have made that last one up. After I make my joke about “just bringing these two guns” (while simultaneously pointing to my biceps), I try to explain that I was at greater risk while attending college than hiking this trail. Creeps: I trust that the trail creates a sense of community, a place where we look out for one another. Making friends are just part of the experience. I also believe that humans have pretty good intuition about folks, and creeps are the least of my concern. Bears: Between the dog stink, proper care of hanging our food, and my own personal commitment to keeping a respectful distance of wildlife, I have minimal fears about needing a weapon when coming into contact with a black bear. On the other hand, let me tell you what I am actually afraid of while hiking: ticks. Honestly, I am most scared of the tick prevalence, especially in this part of the U.S. during the months in which I will be hiking. Unfortunately the likelihood of Flynn and/or I coming down with a tick-borne illness is extremely high. With this in my mind, I want to give you a little background on why I find tick-borne illness so scary for dogs and humans, as well as what we will be doing on our hike to best prevent our chances of tick-borne illness. I am going to start by sending you to a website that is really cool and informational. Check out tick-borne illnesses impacting dogs across the U.S. by clicking here. We use this website at the vet office where I work, and it shows prevalence, as well as the number of positive cases of the following tick-borne illnesses in each state for the past five years. Unfortunately, you’ll notice the pattern covering the same states that the AT passes through. Although this shows the cases for dogs, these are zoonotic, meaning they affect humans too. Lyme: An illness caused by a bacteria carried by deer ticks or black-legged ticks (basically they’re tiny little twerps that are easy to miss in a tick check). Again, Lyme disease affects both dogs and humans. In humans you will often see a distinct red bullseye marking near the site of the bite. In dogs, Lyme causes kidney and liver damage. If not treated, the kidney damage can be severe and lead to early kidney disease and failure. Symptoms for dogs are less obvious, and are usually related to lameness and fever. Anaplasma: Similar to Lyme disease, anaplasmosis is also caused by a bacteria carried by deer ticks or black-legged ticks (making them extra twerpy since they can carry both diseases), and brown dog ticks. It is carried in the blood stream, and sometimes causes neurological issues. In people the symptoms are less obvious, and can be fatal if not treated. Again, in dogs there are minimal obvious symptoms driving diagnosis, including lameness, lack of appetite, and high fevers. In dogs, anaplasmosis is a little confusing because there are two ‘strains’, if you will, that cause two different types of issues. One strain causes internal organ damage and internal bleeding. Basically, it is bad news. If you want more information about the two strains, check the links below. Ehrlichia: Again, another illness affecting both humans and our canine sidekicks. Presenting similar symptoms as the other two we have talked about, ehrlichia is actually an infection of your blood cells. The type of blood cell impacted depends on the particular bacteria; again, check out the links below to get more in-depth information about these various strains. I have to admit, I have not seen any cases of this personally. It tends to be more prevalent in the southern section of the country, areas near the beginning half of the trail. Please note that there are several other tick-borne illnesses that I did not mention here, some less common, but extremely dangerous. 4dx test: This is a blood test, recommended annually, that tests your dog for the three tick-borne diseases, as well as heartworm. Knowing your dog’s status before going on the trail, and treating for any current illness, is really important for your dog’s health. This better ensures that your dog will be able to hike all the way with you from Georgia to Maine. Lyme vaccine: If your dog hasn’t already been vaccinated, this is a two-part booster series. The second booster is administered two to three weeks after the first, and provides a full year of protection until requiring a yearly booster again. As for other tick-borne illness vaccines, I think companies are working on developing some, but at this point, I am not aware of any other vaccines that cover tick-borne illnesses. Feel free to correct me in the comment section below if you know of anything. Routine tick checks: Removing ticks before they bite is ideal, but removing them as quickly as you can to limit the time of exposure is also key. Better late than never, am I right? The transmission period is different for each disease and for some can occur instantly, while others may have several hours of attachment before the illness can be transmitted. Monthly treatment: There are several options in this department, mainly consisting of oral and topical products. Oral products: These are great because they are chewable, the kill time of the tick after attachment is faster, and the protection is systemic in hours, meaning that it cannot be washed off in rainy weather. Topical products: I personally tend to lean toward an oral product, but the key benefit of the topical liquids and collars is that they include a repelling factor that the oral does not. Combination: Flynn and I are going to be using both products. We will use an oral product called Simparica, and a topical product called Vectra. If you are curious about how to use the products together and the timing needed between each use, call your veterinarian. Gear treatment: I will talk more about this in the tips to keep you safe section below, but this applies to your dog too. While treating your gear, treat their gear too: collar, pack, booties, jacket/coats, etc. Also, the specific product that I mention below is actually labeled as safe for direct spray onto your dog. 4dx: Again, checking to see if your dog picked up a tick-borne illness during your hike is crucial; the sooner you catch it and treat it, the less damage done to your dog. It’s best not to wait until you dog is symptomatic before testing. Tick-borne illnesses are painful, miserable, and can cause permanent organ damage, as well as death. As a side note, although I have been working as a technician at a small animal veterinary hospital, I am certainly not a veterinarian. If you are taking your dog for a long hike, or even a short hike, you should be both informed about, and using tick prevention. If you ever have concerns or questions about products, or tick-borne illnesses, you should check in with your veterinarian. They are a great resource, and tend to be really accommodating. They are super helpful in finding science-based information related to the specific health concerns in your area. Routine tick checks: The same principles mentioned in the tips to keep your dog safe section apply here. Time of attachment, or the ability to stop attachment altogether, are extremely important. 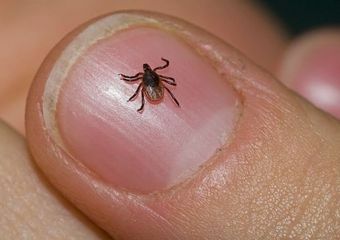 Do quick tick checks several times a day, and take time to check especially well before you go to bed. Don’t be shy, those little bugger like to get in all of your warm crevices, so spend a little time, and be sure to check all over. Gear treatment: I mentioned this briefly in the tips to keep your dog safe section, but let’s get more into detail. Lucky for us, there is great product called Permethrin. It isn’t oily, and is labeled as safe to use for treating all your gear. I’m talking your tent, sleeping bag, backpack, socks, boots, sleeping pad, backpack, all your clothing! This product is meant to last six weeks, or six washes. Throw it in your bounce box and use it every few weeks on your gear. They say this stuff works better than deet. Boots and socks: Most ticks hang out in the leaf litter and crawl onto you via your feet. Wearing boots and socks (especially if they are treated with Permetherin) can really help keep those pesky little trolls away. If you are wearing pants, tuck your pants into your socks to keep them out. They’ll have a much longer journey to any skin where they can attach if you do that. Topical treatment: There are lots of products out there; I am most familiar with deet and another called Picaridin. Both work great, and are safe(ish) to use on your skin. Both products keep ticks, as well as most other bugs, flies, and mosquitoes away from you. I know not everyone likes spraying chemicals all over their body, but I am sure six months of use while hiking a trail is better in the long run than forever having bodily damage from a tick-borne illness. If you have any other thoughts, or if I missed any key tick prevention for humans or dogs that’s on your radar, write it down in the comments. As ticks become more and more of an issue each year, it’s important for us to keep up on new products, and new ways of protecting ourselves and our furry friends from tick-borne illness. Happy hiking, and don’t forget to tick check! *I would also like to state that all these tips are based entirely on my own personal experience. I completely understand and respect the opinion’s of others, and I know that often many folks prefer taking a more natural approach. Please do not think for one second that I am forcing my decisions on you. Do your thang, do your research, and do whatever works best for you and your dog to deter those nasty ticks. Photo courtesy of Flickr from the Creative Commons! A great essential oil for repelling tics on both people and dogs is Pelargonium capitatum x radens (Rose geranium). There is more than one type of rose geranium so you want to be sure the botanical name is as above. For dogs put a drop at base of tail and a drop between shoulder blades. (Or you can put a few drop on dogs collar if you do not want to apply directly. For people it is suggested to put a drop behind each knee on both wrists and base of neck. When I was on the trail in 2014, I used a bar of tea tree oil soap to wash with and rub on my clothes. It is a natural repellant. I’m going again and will be adding a couple things to my routine. I’ll be adding tea tree essential oil to put a few drops on my boots and socks. Also just read about taking Astragalus capsules. I will be taking it now before I begin to hike and will take one each day while on the hike. It is recommended by Stephen Harrod Buhner, in his book “Healing Lyme”. 1000 mg – 3000 mg in high risk areas. Like anything you ingest, check with your doctor if you have health issues. Is there a specific brand you can recommend that uses that particular rose geranium. I have also seen a spray bottle recipe that uses rose geranium, vodka or witch hazel mixed with distilled water. I know there is some controversy with regards to applying essential oils directly to the dog. Thanks for that specific botanical name. I was bitten by ticks while camping and now I can no longer eat meat. Tick induced mammalian meat allergy is another increasingly common tick related issue! If you like steak, avoid them at all cost. I have heard about that before! From the Lonestar tick I believe? Yikes!! For the sake of steak, we had best protect ourselves from those ticks! I read that perhmetrin is Not safe to use on your skin only clothing. For dogs, I’ve found that Bravecto works the best. It’s orally administered every 12 weeks. NO NO NO! Permethrin is NOT ever safe to use on human skin, it is a nerve agent. On your gear, yes, skin never. Thank you!! I edited the post accordingly! Great info.ill keep a close eye on my gear and body while hiking.